My colleague and I have been searching for new places to have lunch. Our offices have recently relocated from the centre of Sydney CBD to the western side of the city, closer to Chinatown. We decided to have lunch at Chefs Gallery today. 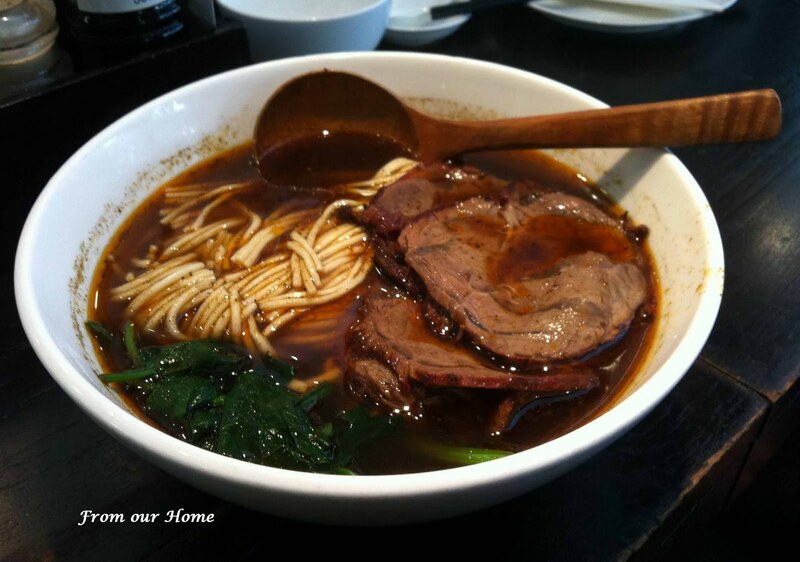 This restaurant is managed Kaisern Cheng, the same restaurateur owner of Din Tai Fung. 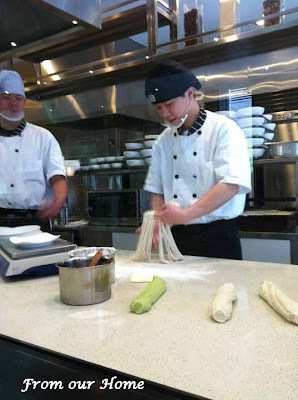 The main focus at Chefs Gallery are the fresh handmade noodles. You can see the chefs making the noodles, as they are ordered. The ready made dough sits in a large container. When you place you order, the chef will cut a piece of dough, roll it, fold it, stretch it, slap it on the bench, fold it again, stretch it again, repeating this process until the dough forms into long thin noodles. The noodles are then weighed before blanching in hot water. We chose seats at the counter facing the kitchen, where we had first class seats to see how the noodles were made. The chef was so quick with his hands, it made it difficult to take the photos with my iPhone. Sandra chose the handmade noodles with sliced beef shin slow roasted in premium soya sauce dipped in a Sichuan spicy soup. She found the dish a little spicy, but not burnt in the mouth. The noodles were cooked al dente with a 'spring' when you bite. 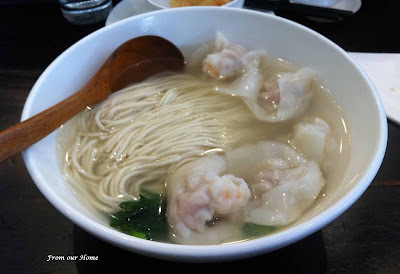 I was tempted to choose a spicy soup noodles too, but I chose Prawns and Pork Wontons with handmade noodles in a chicken soup instead, as I had a slight sore throat. :-( I enjoyed the clear chicken broth, well balanced and not too salty. Perfect to soothe my throat. The wontons were plump and delicate, with an almost transparent skin. 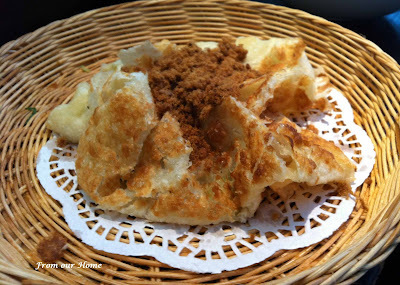 We also ordered the Fluffy Chinese Roti with Pork Floss. We love the soft and crunchy roti which was similar to a flaky shallot pancake. The crispy Pork Floss gave it a sweet taste. It was a pity that there was only the two of us. There are many other dishes on the menu that I would like to try such as handmade egg and spinach tofu lightly pan-fried topped with preserved vegetables, mini pork burgers (looks cute in the photo in the menu), steamed sesame 'piggy face' bun and many more. I reckon the better choice to test the quality of cooking at Chefs Gallery is the clear broth with prawns and dumplings. They look yummy in the photo! It was a definitely good idea to be able to sit on the counter and watch the making of the fresh noodles. The wontons look tempting. Makes me want to try them. *slurp..slurp*....the meals looks very professionally created. Must be good! Wow! It all looks delicious. Thanks for highlighting this place, must try next time I'm in the city. Hope you're better now.